The Michigan Family Nutrition Program (FNP) helps Michigan adults with low income acquire the knowledge, skills and confidence to feed their families nutritious, cost-conscious meals. Education traditionally includes presentation, discussion, hands-on activities and written materials. Instructors report that they are finding it increasingly difficult to recruit and retain young adults with busy schedules using these traditional education techniques. 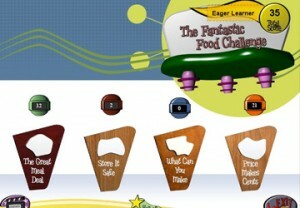 The Fantastic Food Challenge was designed to address this concern. The Great Meal Deal focuses on topics included in the U.S. Department of Agriculture’s Food Guide Pyramid such as classifying foods into food groups and identifying serving sizes. Store It Safely focuses on storing food in the proper location to prevent food-borne illness or food waste. What Can You Make focuses on knowing how to use foods that might be in the kitchen or available from a food program such as the Special Supplemental Food Program for Women, Infants, and Children (WIC). The Price Makes Sense focuses on comparing food prices to get the best buy. The Fantastic Food Challenge was developed through a partnership between the Communication Technology Lab (now GEL Lab) and MSU Extension, Family & Consumer Sciences Program with partial funding from a grant from the United States Department of Agriculture (USDA). The Michigan Family Nutrition program throughout Michigan is currently using the game to motivate and educate its clients. Winn, B. The Fantastic Food Challenge. Exhibited at 2004 Indiana University IDEAs Festival, Bloomington, IN. April 3, 2004. Winn, B., Coleman, G., Fisher, J., Lonsberry, M., Greene, D. Fantastic Food Challenge. Exhibited at DiGRA2003 Digital Games Research Conference, Utrecht, Netherlands. November 6, 2003. Distributed to MSU Outreach centers and Family Nutrition Program paraprofessional instructors in every MI County along with accompanying curriculum materials. 24,100 copies purchased by Allied Health Insurance Company and sent to their customers. Version 1.0 of CD-ROM released in late spring 2004 and distributed through the MSU Extension, Family & Consumer Science Program. Sold ~1000 copies directly to schools, community programs, individuals. “MSU video game designed to improve eating habits.” MSU Today, Fall 2004. ”Games promote nutrition, raise doubts.” The State News. August 17, 2004. “Computer games teach nutrition.” Associated Press. August 15, 2004. “Video games aim to make learning fun.” Detroit Free Press. August 9, 2004. “Video game designed to improve nutrition.” MSU News Bulletin. May 20, 2004. “MSU video game designed to improve nutrition among low-income families.” Newsroom.msu.edu. May 3, 2004. Silk, K.J., Sherry, J., Winn, B., Keesecker, N., Horodynski, M. A., Sayir, A. Increasing nutrition literacy: Testing the effectiveness of print, website, and game modalities. Health Education & Behavior, under review. Winn, B., Coleman, G., Fisher, J., Lonsberry, M., Greene, D. Fantastic Food Challenge: Using Games to Improve Food and Nutrition Habits of Adults. Computer Game Technology Conference, Toronto, Canada. Poster shown and game exhibited on Friday, April 9th, 2004. Coleman, G., Winn, B., Fisher, J., Lonsberry, M. Utilizing digital games to teach food and nutrition. Society for Nutrition Education Conference, Philadelphia, PA. July 29, 2003. Winn, B. Games to Improve the Mind and Body. Presented at the Games for Health Conference. Madison, WI. September 17, 2004. Winn, B. Creating Games for Fun AND Learning. International Game Developers Association Southern Michigan Chapter Meeting, Southfield, MI, October 12, 2003. Food and nutrition education utilizing an interactive CD-ROM Format. G. Coleman, B. Winn, D. Greene. Funded through Family Nutrition Program (50% USDA/50% State and local match). Funding 1/2 GA in Comm Tech Lab Spring 2002-Spring 2003. Fantastic Food Challenge: Increasing Nutrition Literacy Through Interactive Technology, Michigan State University Families and Communities Together Coalition (FACT) Grant, April 2005, $38,000, with K. Silk, J. Sherry, and B. Winn. Funded.